Successful execution of mitosis requires exquisite regulation and interplay of a myriad of proteins. 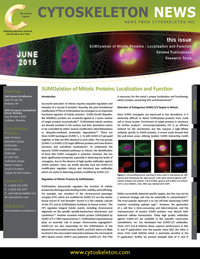 Recently, the post-translational modification (PTM) of SUMOylation has emerged as an important functional regulator of mitotic proteins1. SUMO (Small Ubiquitin-like MOdifier) proteins are covalently ligated to a lysine residue of target proteins enzymatically2,3. SUMOylated mitotic proteins are densely localized in the nucleus and their abundance seems to be controlled by either reverse modification (deSUMOylation) or ubiquitin-mediated proteolytic degradation4,5. There are three SUMO paralogues (SUMO 1, 2, 3) with SUMO-2/3 grouped together as they are 96% identical to each other. The two groups (SUMO-1 vs SUMO-2/3) target different proteins and have distinct functions and subcellular localizations6. To understand the dynamic SUMO-mediated pathways in mitosis, the identification of bona fide SUMO conjugates is essential. However, this has been significantly hampered, especially in detecting low levels of conjugates, due to the absence of high-quality antibodies against SUMO proteins. Here, we briefly describe how the SUMO-2/3 modification regulates mitosis and introduce new antibodies which are useful in detecting proteins modified by SUMO-2/3. SUMOylation dynamically regulates the function of mitotic proteins by altering protein binding motifs, stability, and trafficking. For example, two members of the chromosomal passenger complex (CPC) which are modified by SUMO-2/3 are the mitotic kinase Aurora B7 and Borealin8. Aurora B is the catalytic subunit of the CPC and its SUMOylation facilitates its kinase activity7. The CPC regulates integral mitotic events, including chromosome alignment on the spindle, spindle-kinetochore attachment, and cytokinesis7,8. Another essential mitotic protein SUMOylated by SUMO-2/3 is DNA topoisomerase II. SUMOylated topoisomerase plays an essential role in proper chromosome segregation9. SUMO-2/3 are also responsible for the SUMOylation of the kinetochore-associated proteins BubR1 and Nuf2 which are likely involved in the noncovalent interaction between the microtubule (MT) kinesin motor CENP-E and polymeric SUMO-2/3. This PTM is necessary for the motor's proper localization and functioning, which includes connecting MTs and kinetochores10. Since SUMO conjugates are expressed in low abundance, it is extremely difficult to detect SUMOylated proteins from crude cell or tissue lysates. Enrichment of target proteins is necessary for further analysis11. Immunoprecipitation (IP) is an efficient method for the enrichment, but this requires a high-affinity antibody specific to SUMO proteins. A recent study showed that the pull-down assay utilizing tandem SUMO interacting motifs (SIMs) successfully detected specific targets, but this may not be a universal strategy and may be vulnerable to contamination12. The most popular approach is to use cell lines expressing SUMO mutants containing epitope tags13. However, the generation of a cell line is time-consuming and labor-intensive, and the overexpression of mutant SUMO proteins may disturb well-balanced cellular homeostasis. Today high quality antibodies against SUMO-2/3 are available to the scientific community. 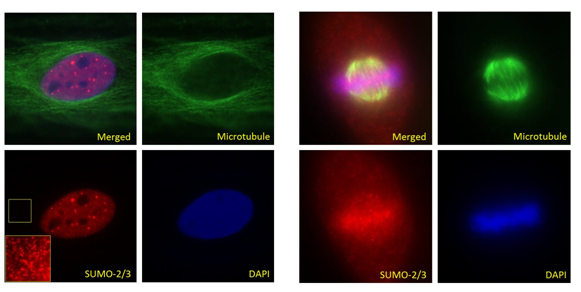 Cytoskeleton, Inc. has developed two SUMO-2/3 antibodies. Clone 12F3 (Cat.# ASM23) shows superior performance in WB, IF, and IP applications over the popular clone 8A2; the other is clone 11G2 (cat# ASM24) which is extremely sensitive in the IP application. Briefly, we present example data of IF and IP experiments which are consistent with previously published results10,11. Most of the SUMO-2/3-conjugates are heavily localized to the nucleus during interphase (Fig. 1A), but cytoplasmic proteins are also SUMOylated (see the inset in Fig. 1A). When cells enter mitosis, some SUMOylated proteins (e.g., RanGAP114 and Topoisomerase II9) are clearly visible on kinetochore-centromere structures (Fig. 1B). 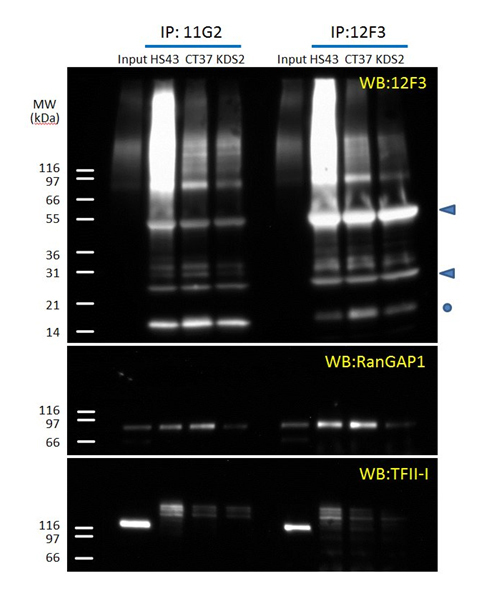 The enrichment of SUMOylated proteins by IP makes it possible to detect specific targets (even those in low abundance) such as TFII-I. SUMO-2/3 conjugates from HeLa cell lysates were precipitated by 11G2 and 12F3 antibodies. The total precipitates were immuno-blotted with anti-SUMO-2/3 (12F3), and specific proteins (TFII-I and RanGAP1) were probed with corresponding antibodies (Fig. 2). Interestingly, RanGAP1 is mono-SUMOylated by either SUMO-111 or SUMO-2/3. The precipitation of SUMO-2/3 conjugates by two different antibodies shows slightly different profiles. A linear epitope has been identified for 12F3, while 11G2 appears to recognize a conformational epitope. Figure 2. Immunoprecipitation of SUMO-2/3 targets with 11G2 and 12F3. Denatured cell lysates were prepared from HS43 (43C heat shock), CT37 (Control) and KD S2 (shRNA knock-down of SUMO-2)15. Arrow heads indicate the heavy chain and light chain of antibodies and unconjugated free SUMO is denoted by circle (o). PTMs fine-tune mitotic protein function to insure successful cell division. To fully understand the dynamic nature of PTMs, it is necessary to identify the substrate proteins and the downstream signaling cascades. Many PTM-mediated regulatory mechanisms remain to be discovered in mitosis (and other cellular processes). To aid in this effort, Cytoskeleton, Inc. has developed high quality specific antibodies to various PTMs, including SUMOylation by SUMO-2/3. These new antibodies will provide a convenient and straightforward means to detect and study new PTM targets as well as contribute to the discovery of new regulatory mechanisms in mitosis and other cell processes. Dasso M. 2008. Emerging roles of the SUMO pathway in mitosis. Cell Div. 3, 5. Hay R.T. 2005. SUMO: a history of modification. Mol. Cell. 18, 1-12. Wang Y. et al. 2009. SUMOylation and deSUMOylation at a glance. J. Cell Sci. 122, 4249-4252. Uzunova K. et al. 2007. Ubiquitin-dependent proteolytic control of SUMO conjugates. J. Biol. Chem. 282, 34167-34175. Prudden J. et al. 2007. SUMO-targeted ubiquitin ligases in genome stability. EMBO J. 26, 4089-4101. Ayaydin F. et al. 2004. Distinct in vivo dynamics of vertebrate SUMO paralogues. Mol. Biol. Cell. 15, 5208-5218. Ban R. et al. 2011. Mitotic kinase Aurora-B is regulated by SUMO-2/3 conjugation/deconjugation during mitosis. Genes Cells. 16, 652-669. Klein U.R. et al. 2009. RanBP2 and SENP3 function in a mitotic SUMO2/3 conjugation-deconjugation cycle on Borealin. Mol. Biol. Cell. 20, 410-418. Azuma Y. et al. 2003. SUMO-2/3 regulates topoisomerase II in mitosis. J. Cell Biol. 163, 477-487. Zhang X.D. et al. 2008. SUMO-2/3 modification and binding regulate the association of CENP-E with kinetochores and progression through mitosis. Mol. Cell. 29, 729-41. Becker J. et al. 2013. Detecting endogenous SUMO targets in mammalian cells and tissues. Nat. Struct. Mol. Biol. 20, 525-31. Da Silva-Ferrada E. et al. 2013. Analysis of SUMOylated proteins using SUMO-traps. Sci. Rep. 3, 1690. Rosas-Acosta et al. 2005. A universal strategy for proteomic studies of SUMO and other ubiquitin-like modifiers. Mol. Cell Proteomics. 4, 56-72. Joseph J. et al. 2002. SUMO-1 targets RanGAP1 to kinetochores and mitotic spindles. J. Cell Biol. 156, 595-602. Barysch S.V. et al. 2014. Identification and analysis of endogenous SUMO1 and SUMO2/3 targets in mammalian cells and tissues using monoclonal antibodies. Nat. Protoc. 9, 896-909.